The header image to this weblog is from Idylls of the King, first published by Edward Maxon & Company in 1859, which is a collection of 12 narrative poems by the English poet, Lord Alfred Tennyson. 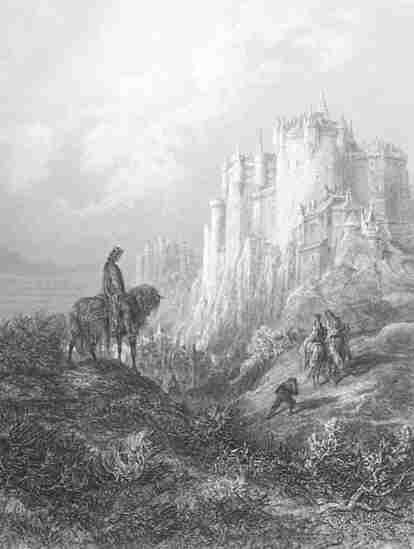 The image is by Gustave Dore and is titled “Edyrn with His Lady and Dwarf Journey to Arthur’s Court.” Lord Tennyson retells the legend of King Arthur, his knights, his love for Guinevere and her tragic betrayal of him, and the rise of Arthur’s kingdom. The image from Plate III of the book. The castle is Camelot. The man on the horse is Geraint. To the right of Geraint is “His Lady” and “The Sparrow-Hawk: Sir Edyrn, son of Nudd.” “His Dwarf” is cropped out of the image. “These two things shalt thou do, or else thou diest. Thou shalt give back their earldom to thy kin. And there the Queen forgave him easily. In the great battle fighting for the King.